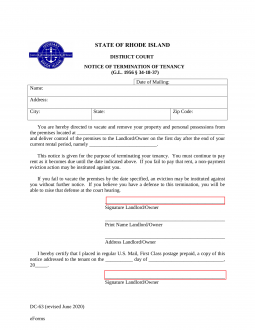 The Rhode Island Lease Termination Letter | 30-Day Notice although it’s a very simple document to navigate, it is a legal document that must be served landlord to tenant or visa versa, to provide the 30 day notice that every rental agreement requires to vacate. This simple document must be completed and sent or delivered in order to be in compliance with your lease. When you’re prepared to vacate the premises where you reside, or if you’re a landlord who would like to take possession and would like to provide your tenants with notice to vacate, this is the legal document to use. Tenant should then arrange for a turn off date for utilities.